Vancouver, BC - Explosive Canadian rockers ART OF DYING have announced the dates for their US headlining tour, their first shows on American soil since releasing the 13 song full length, Rise Up (Eleven Seven Music). Newcomers CHILDREN 18:3 and LETTERS FROM THE FIRE have been handpicked as support for the 40+ date run. Tickets and exclusive VIP upgrades are available now through EnterTheVault.com. 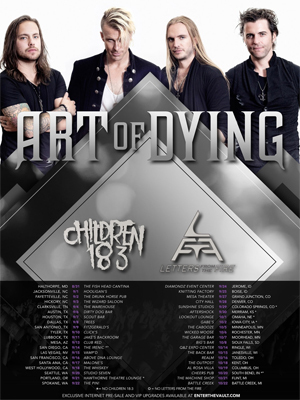 "We are looking forward to this tour in a big way", says ART OF DYING frontman Jonny Hetherington. "A lot of amazing clubs in some of our favorite cities where we are able to get up close and personal with our biggest fans at our VIP engagements. We're also stoked to be bringing along some cool new bands." Check out the tour announcement video below.